KUALA LUMPUR (Sept 15): The government has yet to make a final decision on whether to exempt RON95 petrol and diesel from the Goods and Services Tax (GST) when it kicks in on April 1 next year, said Deputy Finance Minister Datuk Ahmad Maslan. "Please don't speculate. We have not made a final decision yet," he told reporters after the opening of the international seminar on “GST: Policy to Practice – Experiences from around the world” by Prime Minister Datuk Seri Najib Abdul Razak here today. Ahmad said the government plans to gazette the list of tax-exempted and zero-rated goods during the tabling of Budget 2015 on Oct 10. 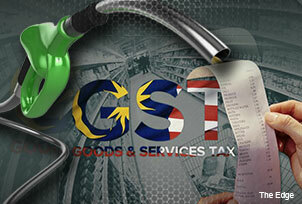 Earlier during the seminar, Datuk Siti Halimah Ismail, under secretary of tax analysis division at Ministry of Finance, said the government has yet to make a decision on whether to impose the GST on fuel, saying it will work in tandem with the subsidy rationalisation policy that had yet to be drawn. However, Sin Chew Daily reported today that GST will be imposed on fuel. The report had quoted Royal Malaysian Customs Department senior assistant director Ishak Daud as saying that 80 items will be added to the zero-rated list before or during the Budget 2015 announcement. PKR strategic director Rafizi Ramli had criticised the move today, saying it would result in higher prices of goods as consumers will have to absorb additional costs in the supply chain due to increase in fuel prices.